Contrary to most reports that’s viewed in the media, traveling to Iran as an American is perfectly safe. With peace negotiations in the works, soon more and more people will view Iran as a go to destination to learn about a culture that’s deeply rich in history. While it is true that there is still anti west sentiments, Iranians are amongst the most hospitable people in the world and will not turn down a guest for any meal. Anyone visiting this nation will surely come away with a sense of fulfillment and the need to visit again. How do I get a travel visa to Iran? Getting a tourist visa can require time and effort, but just think, if it were simple and easy everyone would be going to Iran for their weekend vacations. 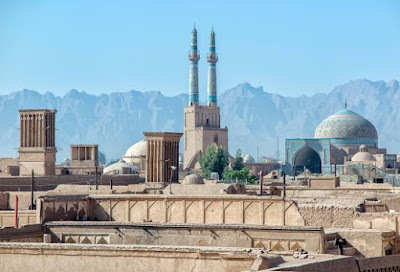 As a US citizen, according to the Iranian Ministry of Foreign Affairs you must arrange a tour or private guide before acquire your visa or you may be sponsored by a friend or relative in Iran who will vouch for you and be responsible for your stay. (See below how) There are two types of visa you can get. Tourist visa: lasts up to 30 days and is extendable. Obtained before coming to Iran and must be used 90 days of issued. Tourist visa on arrival (VOA): lasts up to 15 days on arrival and acquired at any international airport. This option is convenient but risky as you might be denied entry. How do I book the mandatory tours? As I’ve mentioned, US citizens must have an MFA-approved guide to accompany them for the entire trip and must have an exact itinerary. These tour guides are friendly and will not care if you’re American, they understand the ins and outs of the process and will work with you to customize the itinerary for you. I suggest using the Pars Tourist Agency as they have many different packages that are all inclusive. Iran is far less crazy than what you normally see on television. Iranians are well aware of how they are viewed by the west, especially Americans, and go out of their way to be hospitable. Traveling to Iran as an American, you will not be met by anti-west sentiments as long as you follow the proper traveling conduct whenever visiting a foreign nation. That means be respectful of their customs and traditions. Men and women should be aware of their physical contact and displays of affection especially if unmarried. Women especially might have to tailor their clothing to accommodate for the trip. Here is a great guide by travelstyle on what women can and cannot wear while traveling to an Islamic nation. Iran is incredibly safe, although it is better to avoid the regions bordering Pakistan and Iraq as these are noted as heavily trafficked regions for drugs. As an American you are safer walking around in the streets of Tehran at night than you would be in Los Angeles. Do not confront anyone on the basis of religion and you will be fine. In fact, you’ll be surprised how hospitable the people in Iran are. I would not recommend renting a car and driving it in Iran, as these roads and rules are not one any American would be accustomed to. I would either use their public transportation or set up a tour package where transportation is already included. What do Iranians eat? Due to their rich history and passed down traditions, Iranian food ranges greatly from provinces and even to neighboring families. One commonality however, is that Iranian food tend to be healthy and nutritious. You are bound to find something you will like. To taste true Iranian food, it’s necessary to visit an Iranian house. Most restaurants limit the food which they sell causing very little variety in their dishes. When you eat in an Iranian household you get to enjoy the essence of the culture within the company of some of the nicest people you’ll meet. Here are a couple of tips to keep in mind while eating in Iran. Iran is a tea centric culture, your coffee will most likely be instant coffee. Iran is a “dry” nation due to their Islamic traditions which means no alcohol will be served in public. As with any nation you visit, make sure the vendor/restaurant you are enjoying a meal at is up to your hygienic standards. Only eat hot meals from street vendors. Iran’s economy is based on cash. Because of the western embargo your credit cards will not work.What does this mean? You will have to carry large sums of money, and make sure you know how to count correctly. It can be really confusing at the beginning because their money will seem really large and come with lots of zeros. One dollar is equal to 28,969 rial at the time of this writing. A “toman” is ten rial. Some places list their prices in either rial or toman looking to rip you off, make sure to pay attention. Coins are rarely used, and there are no state-issued large bills. To tell if the bill you receive is counterfeit, simply rub the numbers with your fingers and the warmth will momentarily fade the marking. Here are a few suggested guides that will greatly help your visit to Iran. These include what we have covered here as well as top destinations to help you plan your itinerary, local eating spots and maps. Lonely Planet has done it again with this informative guide. It provides a good overview of what to see in the country as a whole and the nuts-and-bolts info that all travelers need, especially to a country so foreign to most Americans. Includes cultural do’s and don’ts, the fact that you have to bring cash (not credit cards or travelers’ checks) and guidance for women on how to dress. Even includes some legal advice regarding personal status law. For trip in May 2014. The Book was accurate in hotel/sights/general info and prices (Inflation can be a problem). This book is very thorough in historical info on different destinations/sights. This book brings together his vast and scholarly knowledge of 2500 years of Iranian history. No writer has achieved this. The narrative is very fluid and easy to read and understand, despite the sometimes complex subjects. I could not wait to finish it, so that I could start reading it again.